Premier Wen Jiabao is going to New York City to attend the UN Conference. China, besides not listening to us when we tell about the problems and the wrong Chinese policies in Tibet, has been carrying out a new policy to strike hard on the Tibetan intellectuals. Thus, this time when premier arrives in New York City, the foreign supporters and the young Tibetan activists led by you must represent those of us in Tibet, who are denied freedom, to tell Premier Wen to improve situations in Tibet and address all other problems in Tibet today which are too many to list here. Please let the premier know that, if China still continues to crackdown, the Tibetan people will get desperate and even wider scale protest than the one in 2008 is likely to happen. Are we going to beat them? How are going to beat them? Let's wait for history to repeat. Let's wait till they go weak. Let's march in with guns. On a freezing night is frustrating too. Tibetan brothers and sisters from the Land of Snow, it has been 52 years since His Holiness was forced into exile and 15 years since the abduction of Eleventh Panchen Lama by the Chinese authorities. On these occasions in 2009, I have found the courage to take great risk to record this appeal against the denial of basic rights in Tibet. Tibet is now facing live and death struggle. Sonam Tashi, popularly called Acho Danny, was a young man when he first went out in search of the late Maja Tsewang Gyurme, one of the 20th century’s foremost scholars and performers of Tibetan music. He wanted to talk with the old man about another figure, a blind musician named Acho Namgyal. (Acho means ‘brother’ in Tibetan.) Though surprised that a young Tibetan wanted to find out about a blind musician from an earlier era, Maja graciously invited Tashi to sit with him, drink tea and talk. This turned out to be the beginning of a journey that took Tashi the next 15 years to complete. To understand the story of the blind musician, he spent innumerable hours conducting interviews about nangma – a genre of Tibetan music that became popular during the 17th century under the patronage of Sangye Gyatso, the capable regent of the Fifth Dalai Lama – with some of the finest scholars of Tibetan music, including Sampho Jigme Rinpoche, Ngawang Lotun Nornang, Sholkhang Sonam Dargyal and the more contemporary Tashi Tsering. Sonam Tashi has now pieced together these interviews, recreations and performances into a documentary, Acho Namgyal: Shey Kyi Jinpa (The Gift of Music). Acho Namgyal was born in 1894 in Dakpo in central Tibet, the birthplace of the 13th Dalai Lama. One day, his parents, who were poor subsistence farmers, left him under a shady tree while they laboured on their farm. But suddenly, a hungry crow said to be as big as a vulture swooped down upon the sleeping child. Hearing shrieks of pain, the parents threw down their spades and rushed to the baby, only to find that his eyes had been plucked from their sockets. Although Acho Namgyal’s world was forever darkened thereafter, blindness ended up heightening the infant’s sense of hearing. Unable to assist his parents’ farm work, from a young age Acho began to play danyen (the Tibetan lute) on the street near his home, earning a few coins from passing villagers and travellers. Gradually, Acho’s fingers learned to nimbly play the danyen, and his hours were spent listening to villagers sing in the fields or while digging canals. He absorbed, digested and then reproduced these folk songs immaculately. Although the exact details have been lost to time, Acho’s life took another sudden turn when a visiting aristocrat from Lhasa saw a blind young boy playing the danyen on a narrow Dakpo street. Recognising his musical potential, the nobleman alighted from his horse and asked the boy whether he wanted to go to Lhasa with him. Once in Lhasa, the nobleman persuaded the famous musician Bai Wali, a Tibetan Muslim, to teach the blind boy, and Wali thus became Acho’s primary music teacher. 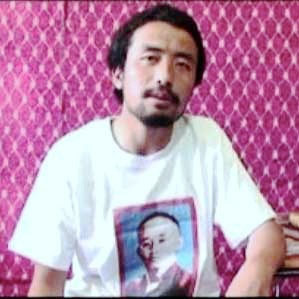 Rabsal Abdul Rehman, another Tibetan Muslim, also taught Acho, and both later joined Acho’s band playing Nangma music. Another defining moment in Acho’s development as a musician came at the annual Shoton festival in Lhasa, during which various opera groups from all over Tibet performed. Chungpa Lhamo, a top Tibetan opera group of that era, performed in the garden of the Norbulingka Palace. Acho sat among the audience as the group, led by the eminent teacher Phurbu Dhondup, a favourite of the 13th Dalai Lama, performed the opera Chungpo Dhonyo and Dhondup – a story about two princely brothers, one of whom went into exile while the other stayed behind to look after his people. Although Acho could not see the performance, his wife described to him the settings and costumes as well as the facial expressions of the artistes, their physical movements and the reactions of the onlookers as they laughed during the comical scenes or cried when the elder brother went into exile. Acho was also listening intensely to every footstep, aria and tune. As he did, new songs were forming in his mind. Later Acho went on to create a pioneering blend of jhangshey or toeshey (literarily ‘dances from Western Tibet’) as performed by the Chungpa group, with the existing Nangma. In so doing, he created and popularised a unique genre that came to be known as Nangma Toeshey, performed for and patronised by the aristocrats as much as it was enjoyed and sung by the whole populace of early-20th-century Tibet. As his talent bloomed, Acho came across many other artistes, mostly ordinary people who were gifted musicians and singers. In the 1930s, Acho’s Nangma multiple bands included two famous lead female vocalists, Sonam Yangzom and Phurbu Dolma, who were known to the general public only by their nicknames Cat and Crow, respectively. A Tibetan Muslim named Akbar played the flute, Bai Wali played piwang (a two-stringed instrument) and another player, Harmeri, played danyen. Acho, meanwhile, played both danyen and piwang. (Other members of the band included Sakya, who played piwang, Pema, the flute player, Rabsal Abdul Rehman, who played danyen, and two other female vocalists, Acha Yertsa and Ghau Number.) Not all these musicians and singers played together in one band. Acho’s various bands would be invited to play during social occasions such as weddings, New Year celebrations and other festivals. Acho also formed a band with his aristocrat friends and students, including Sholkhang Sonam Dargyal, Nornang, Marlampa, Maja Tsewang Gyurme and others. This was an elite group, whose members played mostly for themselves, for fun and to entertain their family members. At the height of his musical career, Acho’s Nangma bands could call on over 75 artistes. Every Saturday morning, a band would rehearse and every afternoon a jamming session would take place involving all the band members. Some Saturday mornings also included poetry readings and tsik gyak, a verbal game in which each member spoke in poetic yet cryptic language, to which others would answer back in the same way. During this time, Acho made Nangma into a household phenomenon in Lhasa. Such was Nangma’s newfound popularity that it gave rise to a saying: ‘Oh, that song! Even my dogs know it from top to bottom!’ Acho passed away in 1942 at the age of 48. The only surviving member from his bands is Pema, the flute player, who still lives in Lhasa. Yet the songs that Acho composed almost a century ago live on today, continuing to form some of the core Nangma performances. The documentary on Acho Namgyal’s life, produced by Sonam Tashi and Eric Henningsen, had its world premiere in Dharamsala in April. As a fitting tribute to Acho’s talent, contribution and legacy, the documentary highlights that it takes an artiste (Tashi himself is an important contemporary Tibetan danyen player, performer and Nangma aficionado) to truly understand the depth and subtle nuances of the music created by another. In making the documentary, Tashi and Henningsen were assisted by some of the top performing artistes from the Dharamsala-based Tibetan Institute of Performing Arts (TIPA), the premier institute in exile that teaches, preserves and performs Nangma, Tibetan opera and other performing arts. Indeed, as with many elements of Tibetan culture, the documentary is also bittersweet in its powerful depiction of a tradition that today largely lives on only outside of the Tibetan Plateau. After the 14th Dalai Lama went into exile in March 1959, the tradition of performing gar – a court dance performed exclusively in the presence of the Dalai Lamas – was banned by the occupying Chinese authorities. Soon other traditional genres of opera, folk song and Nangma were likewise attacked, both for their performing style (which the authorities purportedly considered crude and undeveloped) and for the lack of Beijing-approved ‘ideological’ content. Ancient folk songs were ‘reformed’, to be sung with overtly ideological lyrics in praise of socialism and communist rule. The result is that, by today, Nangma in Tibet is largely devoid of traditional content and style. Only officially approved Tibetan singers, such as Tsetan Dolma, perform during official festivals and functions, still singing songs in praise of the Communist Party of China. In exile communities across the world, however, Tibetan culture continues to flourish, including the music. Led by TIPA, there are numerous performing-arts groups, music bands and Nangma troupes, including one in Switzerland that began as a section of the Tibetan Youth Association in Europe. Its members work in banks and airlines during the weekdays, and spend much of their leisure time playing Nangma songs. At the same time, there is an ever-present danger of external factors influencing the way that Tibetan exile communities live and appreciate traditional cultural forms, including music. The deluge of other culture and musical traditions, ushered in by easy access to the Internet and mass media, inevitably attract young Tibetans away from the traditional music and performing arts. The saturation of Hindi music churned out by Bollywood, along with other global popular music, challenge the niche domain of Nangma and its artistes. Under such circumstances, however, Shey Kyi Jinpa constitutes both a timely and, hopefully, restorative vehicle – offering the possibility of a renaissance of interest in Nangma, and the birth of a new generation of Tibetan musicians.